Rare and desirable, this C1825 jardiniere table is by Gillows of Lancaster, and is made of solid Goncalo Alves, otherwise known as Brazilian Tigerwood. This wood was characteristically employed by Gillows for such tables, although, interestingly, it was less expensive than Rosewood. The Regency, George IVth table features a deep, drum shaped top surmounted by a gallery seen on a number of signed Gillows jardinieres. The deep apron has a removable top, which conceals a recess with a metal liner with a grille for the display of cut flowers. Importantly, while the metal rod is missing, there is a button to allow the easy access to the removable wooden top, a specific Gillows characteristic. Apart from the early-Georgian influenced, slipper foot tripod base, this table conforms to a design by Gillows. Significantly, the strange variant of slipper foot on our table appears on a games table in Plate 331, Volume 1, in Susan E. Stuart's comprehensive work, " Gillows of Lancaster and London, 1730-1840". 78 cm tall and 40 cm diameter. Rare and desirable, this C1825 jardiniere table is by Gillows of Lancaster, and is made of solid Goncalo Alves, otherwise known as Brazilian Tigerwood. This wood was characteristically employed by Gillows for such tables, although, interestingly, it was less expensive than Rosewood. The Regency, George IVth table features a deep, drum shaped top surmounted by a gallery seen on a number of signed Gillows jardinieres. The deep apron has a removable top, which conceals a recess with a metal liner with a grille for the display of cut flowers. Importantly, while the metal rod is missing, there is a button to allow the easy access to the removable wooden top, a specific Gillows characteristic. 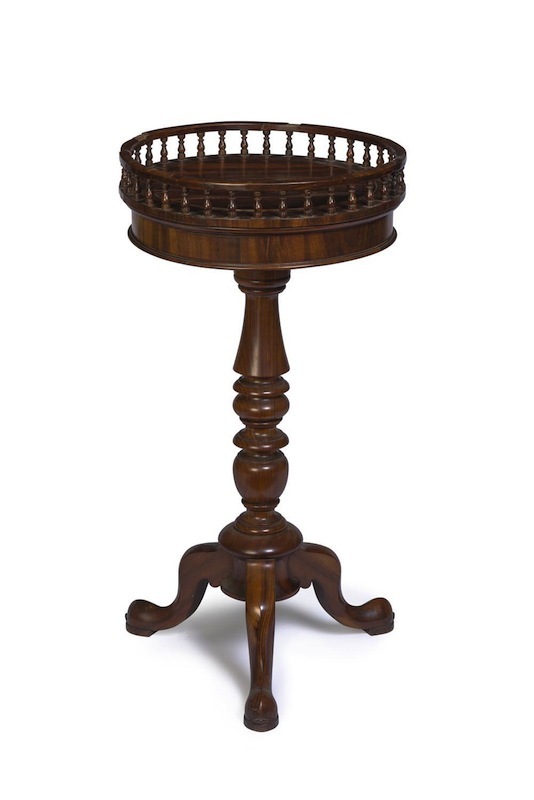 Apart from the early-Georgian influenced, slipper foot tripod base, this table conforms to a design by Gillows. Significantly, the strange variant of slipper foot on our table appears on a games table in Plate 331, Volume 1, in Susan E. Stuart’s comprehensive work, ” Gillows of Lancaster and London, 1730-1840″.